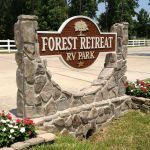 Ask fellow campers about "Forest Retreat RV Park" and nearby attractions. Delightful RV Park. It was easy to navigate and the sites were super easy to get into. They had a secured overflow area which was a good surprise. The laundry area was a comfortable size for the park and easy to walk to from our site. They remembered their four legged visitors and provided doggie bags and waste bins. Office staff was friendly and very helpful. We camped at Forest Retreat RV Park in a Fifth Wheel. Shopping was great, but the service roads were one way in each direction, which meant that you had to drive down to the expressway, come back in the opposite direction to the next exit for a u-turn then down the road to Walmart-which was only 10 minutes or less up the road from the park road. But it was an outing lol. Although higher price than other campgrounds, this one is beautiful with lots of trees, nice pool, full hookup pull through with cable and wi-fi. Stayed over a long weekend to see family in the area ~ will return. We camped at Forest Retreat RV Park in a Fifth Wheel. They Didn't realize our designated site was still occupied upon arrival but allowed us to find a nicer spot with trees and extra space for parking. We stayed two nights. There is good signage and it's easy to find. Staff is very pleasant. 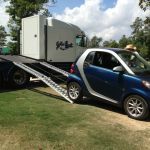 Easy to navigate a big rig in the park. The roads and pads are concrete. The utilities are toward the back of our pull through site, but worked well. The wifi was difficult to sign up, but worked well. Verizon signal was okay. The cable is not digital and is grainy on all channels. The channels on our HD antenna were grainy as well. There were few trees so the satillite worked well. This is a very attractive campground. We would definitely stay again. We camped at Forest Retreat RV Park in a Motorhome. We stayed here for three nights over Memorial Day weekend. 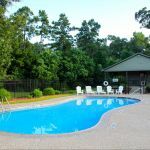 The park is very clean and there is a pool, small dog area, multiple bathroom/showers, and nice clubhouse area with free ice, coffee and newspapers. Cable and wi-fi were working and we took advantage of both. Trash is picked up curbside each morning. The concrete pull-through site we reserved was level and hookups were well placed. There were some long-term residents but the larger room additions/porches and "yard junk" were pretty much non-existent. We were a little disappointed in that the website indicated there were lots of trees, the name of the park is even "Forest Retreat", but in reality the only trees of any size were along the outer edges of the park and only those spaces on the outer ring backed up to the woods. The trees within the park itself were small and sporadic and none of the sites were shaded by trees. It is basically a parking lot with some grass and some small trees. Our "patio area" left us on the concrete staring at the side of the Class A rig next to us. Not many people out and about so it was quiet, although there was some music/PA system announcements from surrounding locations that could occasionally be heard. They also claim to not allow "aggressive breed" dogs, but we came upon a woman walking a large gray pitbull while walking our pup early one morning. So...clean park with nice amenities but not really the "wooded" atmosphere we were expecting. Even though it is 25 minutes from our home, we will most likely not return. 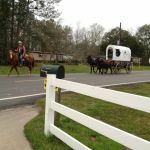 We camped at Forest Retreat RV Park in a Travel Trailer. Definitely a cut above all nearby campgrounds.... excellent in all respects. We camped at Forest Retreat RV Park in a Motorhome. Stayed here for 8 nights. Very clean and well maintained park, some long term guests but sites are neat and tidy. Wifi worked great. Only complaint is shower heads in bathrooms are very harsh, pressure too high and they need to be cleaned of hard water build up. Laundry room was clean. Will stay here again when back in the area. We camped at Forest Retreat RV Park in a Motorhome. It was a nice park, but now bad cable and Internet. We stay here long term, the price has gone up without improvements and all the dogs in park get sick 400 in vet. bills and now someone has put food to kill cats out! My cat just died after 2 days of vomiting. Please take care if you stay, park always full until lately plenty of spots vacant now. We camped at Forest Retreat RV Park in a Fifth Wheel. Plenty of new shopping centers are under construction nearby. Only stayed for three nights but we enjoyed our stay ... the park is clean and neat. Plenty of grass for the dogs, small pet area but plenty of place to walk them including a trail. Locals that are long term keep their places clean. Excellent wifi, trash pickup. 4 or 5 wide pull throughs. Will definitely stop on our yearly journey to Mesa. We camped at Forest Retreat RV Park in a Motorhome. We stayed three nights at the daily rate - $60 less 10% Good Sam discount is $54 per night, all in. We then decided to stay a month because we have resident friends close by (10 miles away from the RV park) and paid the monthly rate of $590, not including $100 deposit towards our one-month's power usage. The park management would not convert our paid three days into the monthly rate. This is the most expensive RV park I have ever been in. There is a leash-off fenced dog run with a bench seat and bags to pick up after the pets. Access to the park was quite easy and our RV is 45' plus we tow a Chevy Avalanche - overall we are about 72'. We unhooked the tow after entering our assigned parking spot. Garbage pickup every morning - leave the bag near the street. About 90% of the residents are monthly tenants. In a week there have not been but about five empty spots in any day. The other parks in the area are much cheaper and generally are full this time of year... if you can fit your RV into them. We camped at Forest Retreat RV Park in a Motorhome. A great park, but highway construction makes it a bit challenging getting in and out unless you know the area. Some exits and entrances are closed. I would urge anyone coming from I-45 to call the office for the best directions. Staff was just great and so helpful. McCleskey is a small, not well marked one block street off the service road. If you miss it, you have to go a long way through some challenging roads because of construction. Everything paved, level, immaculate with good wifi (lots of towers around campground) and great cable. Easy propane fill for motorhomes. Just a block off highway, but noise was not a problem. Our campsite was a little close to our neighbor - awning almost touched his slide, and his sewer was right in our face as we exited our door, but many of the sites were more spacious. No grills or picnic tables. Nice community room with library, comfortable chairs, flat screen TV, Keurig coffeemaker available at all times. Good exercise room. We camped at Forest Retreat RV Park in a Motorhome. This is one of the best parks we have ever stayed in. All sites are paved and level. The Wi-Fi work great and cell phone coverage was good. The staff was very friendly and accommodating. Site price included FREE ice, coffee in the game room, and fax service. The grounds are very clean and well maintained. 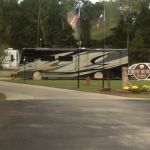 This is one RV resort that we will return to when we are in the Houston area. 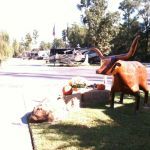 We camped at Forest Retreat RV Park in a Motorhome. This is our second overnight stay here and really like it. The bathrooms are plentiful, spacious, modern and very clean. Cement pads and roads. Good size for us. It accepts ROTTWEILLERS WHICH gives it high marks with us. We don't travel with our dog, but I get very upset at RV parks that have blanket breed restrictions. This park would be perfect EXCEPT we never could get WIFI. Very weak and slow occasionally. We even tried it at non peak times but still could not get strong enough signal. We noticed a lot of mifis in the park so others may have issues also. Love the free ice. Like I said, of over 200 RV parks visited, thus one would be perfect if the wifi worked. We camped at Forest Retreat RV Park in a Motorhome. Deluxe pull-thru sites have cement pads for coaches, small cement patio, and larger grassy area between sites. Park well maintained, very clean, excellent Wi-Fi connection, and friendly staff. On past stays here, laundry and showers were clean & well maintained, but haven't checked this trip. Pet friendly and far enough away from freeway to be very quiet & peaceful. Good Sam discount. We camped at Forest Retreat RV Park in a Motorhome. I gave it an "8" primarily due to the cost. We had Good Sam and got $5 off. Our site was a "deluxe". I would hate to see what the "premium" and "ultra" sites cost. The park is nice. Sites are cement, with cement pad for car parking. This is the first park we have seen in the last 500 miles that is almost sold out. It is near some of the hospitals in Houston. Free WiFi and a free DSL line in the day room. No charge, and allowable, to wash your RV at your site. But, you can't wash your car. Very nice dog park. Nice outdoor pool, but I would expect a hot tub and maybe an indoor pool at this price. No picnic tables. They have a central area for a campfire. It is less than a mile off the highway and you have no highway noise. We camped at Forest Retreat RV Park in a Motorhome. Rate is based on monthly. WOW! This is one nice park! Clean, neat, friendly, free cable, Wi-Fi and ice. When we first arrived, I had an open ground error on my EMS. Within 1/2 hr the CB and plug were changed and we were good to go. Grass is green, cut and trimmed every week. There is just nothing negative to say. We camped at Forest Retreat RV Park in a Fifth Wheel. Are you affiliated with Forest Retreat RV Park ?